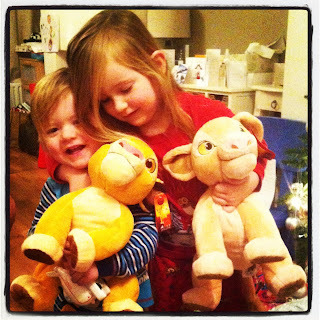 I haven't had a lot of time lately to blog but I just wanted to post my favourite Christmas photo here of Isla and Noah. Christmas morning with their favourite presents - Simba and Nala from The Lion King - a film that we watched non stop before Christmas as it was Noah's first film obsession! He's moved on to The Grinch now.......gah! So cute....what a gorgeous family.